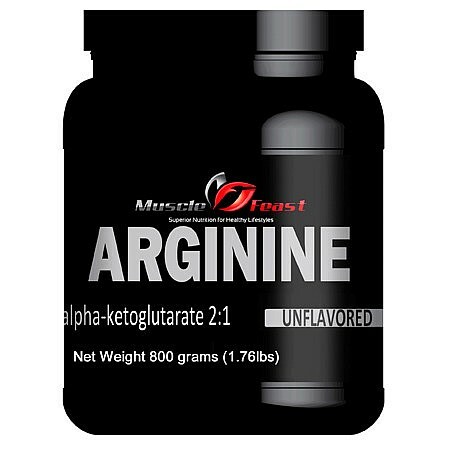 What is L-Arginine AKG 2:1? Arginine alpha-ketoglutarate (AKG) is a salt formed by combining two molecules of the amino acid L-Arginine and one molecule of alpha-ketoglutarate. L- Arginine is a nonessential amino acid that influences several metabolic factors that are important to athletes. AKG (alpha-ketoglutarate) is the nitrogen-free portion of the amino acids known as glutamine and glutamic acid. It is formed in the Krebs cycle; the energy-producing process that occurs in most body cells. AKG is used by cells during growth and in healing from injuries and other wounds and is especially important in the healing of muscle tissue. The alpha-ketoglutarate version of arginine is more efficient. When you combine these two things it’s more easily absorbed, plus you get the benefits of both compounds. This combination has been shown to boost insulin in healthy men and help small children grow faster. So not only will it improve your blood flow but it also boosts your hormones and makes you grow faster. What are the benefits/uses? It helps with your immune system, releases hormones and removes ammonia from your body. Arginine also helps heal your wounds and takes part in cell division. Arginine will relax your blood vessels so that they widen and allow more blood to flow through. Arginine also helps to produce nitric oxide and is necessary to create creatine; which are very beneficial especially if you workout. 1998 was a notable year for L-Arginine. It was in this year that the Nobel Prize was awarded to three American scientists who discovered that arginine also aids in the creation of nitric oxide. Nitric oxide helps our veins relax and puts less stress on our hearts because our blood can flow easier. Better blood flow can also boost your performance in the gym. Also in this year, a group of Italian scientists discovered that arginine helped reduce blood pressure in their patients. Arginine started to appear so beneficial that doctors would take it and then end up recommending that their patients take it. Hospitals were even giving it to their patients so that their infectious wounds would heal quicker. It was in the 1990s when the surge of arginine products started hitting the market. This is when you would have first started to see a lot of nitric oxide supplements come out. Later it was found that when you combine arginine with alpha-ketoglutarate it ensures that the arginine is more easily absorbed. With this more efficient version or arginine you won’t have to use as much of it and you’ll get “more bang for your buck”. It’s usually listed as AAKG on supplement labels.